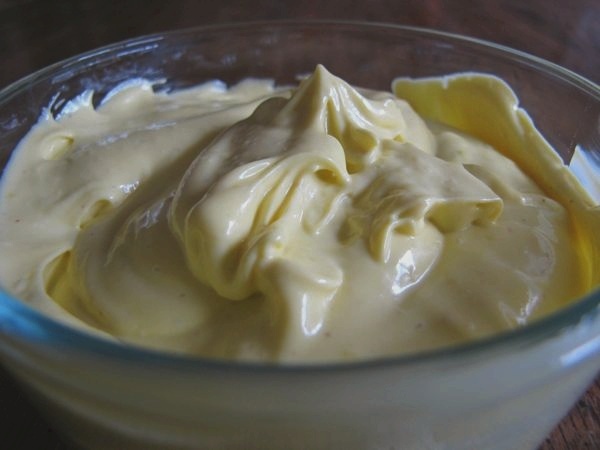 Mayonnaise is a smooth savoury sauce made from oil and the yolk of eggs. Mayonnaise is notoriously difficult for the beginner, as it often curdles, but easy once you have the knack. In a large bowl, beat the egg yolk with a wire whisk for about a minute. Then add the mustard, salt, and half the lemon juice. Whisk for another minute – the mixture should thicken very slightly. Then, very slowly, add half the oil with one hand whilst whisking with the other. Start drop by drop, incorporating each drop before adding the next, and build up to a trickle. Keep going until the oil is whisked in. Add the rest of the lemon juice, whisk to combine. Add the rest of the oil in the same manner as before. Keep going until all the oil is whisked in. You can now stir flavourings such as crushed garlic into the finished mayonnaise, or use the mayonnaise as a base for other sauces. One can make the whisking process easier by using a kitchen towel. Wet a kitchen towel, or any small towel, until it is very wet and heavy, but not dripping. Coil the towel on top of a flat surface, such as the kitchen countertop or a table. Place the bowl onto the circle. This will provide a steady base for the bowl and allow you to whisk with one hand while adding ingredients with the other. If the mayonnaise should curdle, it can be recovered by slowly dripping the curdled mayonnaise into another egg yolk while whisking vigorously all the time. ½ teaspoons white sugar can be added for those with a sweet tooth. Add with the salt at the beginning. It's easier to just use an immersion blender for the whisking. In case the mix curdles, you can put the curdled mix away, start with a new attempt and once you get the emulsion going, add the curdled mix just as you were adding oil. For special occasion, you can spice up this recipe by making Juanz mayonnaise. Just add about a handfull of finely chopped Cilantro and about half a tooth of crushed garlic. This is also known as Banana's Mayonnaise. I like this recipe so far but switch out the mustard and the lemon juice and replace it with white wine vinegar at least 2 tablespoons of it.